This tour challenges you to find out just how many adrenaline pumping thrills can you pack into one half day adventure. Cross the border into Zambia from Victoria Falls and strap into more excitement than you thought possible. 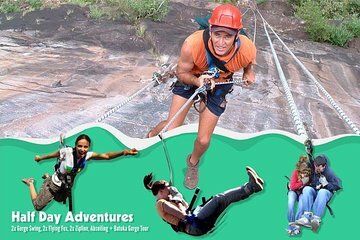 Take a flying leap over the gorge on the Gorge Swing, try abseiling, zipping along on the flying fox and zip-line, then take a tour of the Batoka Gorge.